New England is not what most people would think of as "big tree country." Yet, there are some respectable columns of cellulose rising from the ground here. Massachusetts, in particular, grows a number of respectable white pines, and other species as well. In fact, the tallest living thing in New England (and then some) is rooted in a protective cove in a Western Mass state forest reserve. It's an eastern white pine (Pinus strobus). 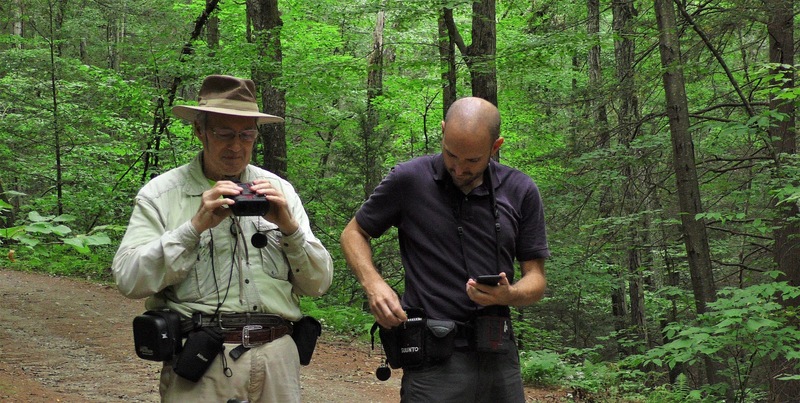 In September, 2017, the "guru" of eastern old growth forests, Bob Leverett, re-measured the tree, which he's been keeping close watch on for 25 years. This tree is not a particularly old specimen, as old trees go; it sprouted from seed in the Civil War era, so is roughly 160 years old now. But it has taken advantage of the site conditions to rocket its way skyward, now scraping low-lying cloud bottoms at 175 feet. A number of other nearby pines are not far behind. The pines in this stand are currently affected by a fungal infection known as "needle cast," which is causing their foliage (needles) to drop. The thinning in their crowns is quite noticeable, sadly. In spite of this, the trees are still growing, although for how long is a painful question to contemplate. Bob knows all there is to know about measuring trees; you could say he wrote the book. No, really-- he and Don Bertolette just wrote new chapter and verse on tree measuring methods for American Forests, keepers of the national champion tree registry. Friends, what we now have is an 84-page (and growing) tome that will guide anyone with enough lignin in their cells to the irrefutable dimensions of a tree. Bob, Don, and Matt Markworth also head up the newly formed American Forests National Cadre, a group specializing in proper measurement techniques for national champion trees. And as a co-founder and Executive Director of the Native Tree Society (NTS), Bob is well-known across the country. The science (art?) of measuring trees has changed with the times and technology. The methods of yesteryear may have been relatively inexpensive (eg, a lengthy tape measure and a clinometer), but you got what you paid for... frustration and inaccuracy. It's one thing to be tasked with measuring the height of a flagpole in the middle of an open field. 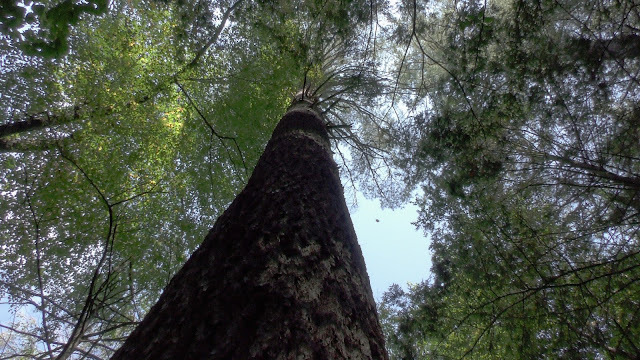 But imagine a tree on a steep slope surrounded by dozens of other trees, all with foliage that obscures your view of the top and/or base of the tree to be measured. In the "old" days, you'd stretch the tape measure out to perhaps 100 feet from the tree, as the baseline of a right triangle. Then you'd determine the angle formed by that baseline and an imaginary line to the top of the tree, using a clinometer. Apply some basic trigonometry (that just scared you away, huh? ), and presto! You just calculated the height of the tree! The only catch is, you didn't get the right answer (for a number of reasons, not all of which are readily apparent). In comes today's technology. We now can reduce that burdensome method to a mere press of a laser rangefinder button. Well, ok, it's not really quite that straightforward all the time, but that's essentially what it's about. The tool measures distances and angles, and does the math for you. We have produced a short film in which Bob and Matt explain the basics of tree measurement, using today's methods; don't worry, you'll be spared... it only covers about 4 of the 84 pages of the manual. Just enough to give you an idea of how trees are officially measured for champion status. You can see the film at our Youtube channel (click here), or click on the embedded video below (if you're reading this in an email feed, you may not see the embedded video link). Be sure to select "1080p60" as the viewing quality from the gear wheel "Settings" icon at the bottom right of the youtube screen.